The last time an in-flight escape system test for a crew capsule took place was during the Apollo program, in 1966. Now, you can watch live as Blue Origin tests the escape system for their New Shepard rocket on Wednesday, October 5, 2016 at 10:45 a.m. ET. The test was originally planned for today (Tuesday) but was postponed because of inclement weather. As founder Jeff Bezos described the test, “Our next flight is going to be dramatic, no matter how it ends.” If all goes well, the crew capsule (empty, this time) should land rather gently. The likely end for the rocket booster, however, will be its destruction in a ball of flames. Although the New Shepard has already launched successfully four times since November 2015, this fifth flight will test the system to protect future passengers from any anomaly during launch. 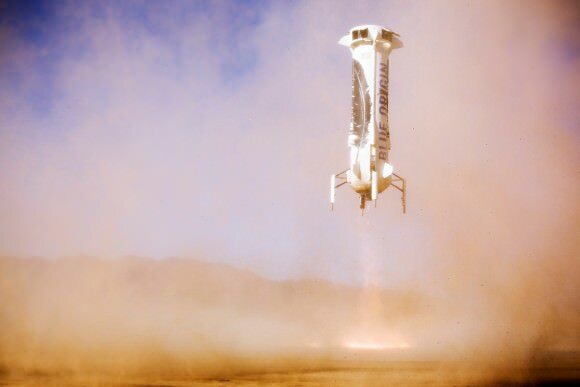 Unlike the Apollo escape system that used an escape “tower” motor located on top of the capsule to ‘pull’ the crew cabin away from a failing booster, New Shepard’s escape system is mounted underneath the capsule, to ‘push’ the capsule away from a potentially exploding booster. About 45 seconds after liftoff at about 16,000 feet, we’ll intentionally command escape. Redundant separation systems will sever the crew capsule from the booster at the same time we ignite the escape motor. The escape motor will vector thrust to steer the capsule to the side, out of the booster’s path. The high acceleration portion of the escape lasts less than two seconds, but by then the capsule will be hundreds of feet away and diverging quickly. It will traverse twice through transonic velocities – the most difficult control region – during the acceleration burn and subsequent deceleration. The capsule will then coast, stabilized by reaction control thrusters, until it starts descending. Its three drogue parachutes will deploy near the top of its flight path, followed shortly thereafter by main parachutes. While SpaceX successfully tested their escape system in May 2015, it wasn’t an in-flight test. The Crew Dragon spacecraft abort system was launched off a specially built platform at Cape Canaveral Air Force Station’s Space Launch Complex 40 in Florida. The engines fired for about six seconds, instantly producing about 15,000 pounds of thrust each and lifting the spacecraft out over the Atlantic Ocean and parachuting safely into the water. Bezos said that while they’d really like to retire this New Shepard booster and put it in a museum, that’s probably not a possibility. New Shepard comes in for a landing with drag brakes and landing gear deployed. Image: Blue Origin. You can access the live feed on Blue Origin’s website. SpaceX may be getting all the attention today, but the Blue is coming on strong! Yes, SpaceX has the Raptor engine ‘in the wings’, but ‘The Blue’ is flying a methane/LOX engine today! I wonder if they (Blue. Horizons) have any plans for Mars? Whoever gets there first and demonstrates a way to make fuel for the return trip will definitely have a ‘leg up’ on the competition! Before they start on planning for Mars, I suggest they plan for any horizontal displacement as that would be a great improvement…. Successful test of the escape system and the booster survived the separation, kept on firing and landed back intact. where’s the wicket to cash in the bet? Previous PostPrevious When Will We Send Astronauts to Mars? Next PostNext What Happens When Black Holes Collide?